WASHINGTON – At a special reception attended by a standing room audience at the Japanese Ambassador’s residence in Washington, D.C., on May 21, 2013, Terry Shima, Executive Director Emeritus of the Japanese America Veterans Association (JAVA), was presented with The Order of the Rising Sun, Gold Rays with Rosette by Ambassador of Japan Kenichiro Sasae. This honor was made in recognition of many years of significant contributions toward building strong relationships between Japan and the United States, and for his tireless work educating this generation on the Japanese American experience during WW II. The award, given in the name of the Emperor, is one of the highest honors bestowed upon a non-Japanese civilian. Shima remarked that he was accepting the award “on behalf of the volunteers of JAVA and the Nisei who fought in Europe and the Pacific.” Well over two hundred of Shima’s family members, relatives, friends, and associates were in attendance. The theme of the evening was his role as a “Citizen”, both of the United States of America and as a citizen of the world. 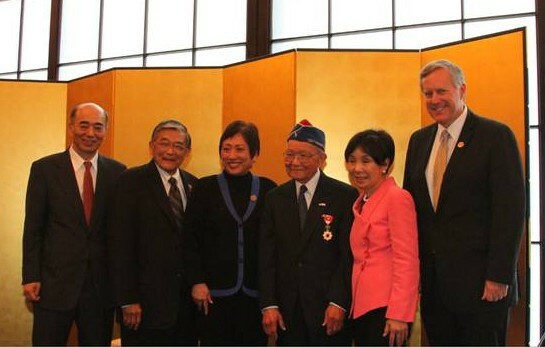 Shima received high praise for his achievements from Congresswoman Doris Matsui (D-CA), Congresswoman Colleen Hanabusa (D-HI), Congressman Mark Meadows (R-NC), and former Secretary of Transportation and Commerce Norman Mineta. Letters from Senator Mazie Hirono and Secretary of Veterans Affairs were read. Other recipients of this award include actor George Takei and Floyd Mori, former National Executive Director of the Japanese American Citizens League (JACL). Shima was born and raised in Laupahoehoe, Hawaii, and is a veteran of the 442nd Regimental Combat Team in World War II, considered to be one of the most decorated units of its size in American military history. After being discharged from the Army in 1946, Shima attended Georgetown University School of Foreign Service and Graduate School, after which he served at the U.S. Forces Japan Headquarters and the U.S. Department of State, including the U.S. Embassy in Tokyo. Becoming the Executive Director of the Japanese American Veterans Association (JAVA) in 2004, Shima was recognized for spearheading programs benefitting all Asian Pacific American veterans and their families. Recently retiring from his post, he remains head of JAVA’s Education and Public Outreach Committee which preserves the legacy of the World War II Nisei soldiers through providing presentations, talks, classroom teaching aids, and panel discussions at education institutions, community organizations and government entities. He also assists the media in providing background information on the Japanese American experience during World War II and arranging interviews. As JAVA Executive Director, Shima played a significant role in the National Veterans Network’s effort to coordinate the arrangement and celebration of the 2011 Congressional Gold Medal Award to the 100th Battalion, the 442nd Regimental Combat Team, and the Military Intelligence Service. The award, the highest civilian honor the nation can bestow on an individual or organization, is intended to honor persons “who have performed an achievement that has an impact on American history and culture…in the recipient’s field long after the achievement,” was presented with over 350 veterans in attendance, many in wheel chairs, who came to Washington, DC for this event.